Island Clean Air Duster 3000 air purification unit. This unit has double the filtration capacity of the Duster 2000 model and will handle a larger facility. This unit has been fully refurbished with new carbon and can be outfitted and an upper dust filtration system. As shown the unit has the .3 micron filter. • Located in our Woodstock, GA Technical Center and available for operational inspection. Trimfast 60"" Tabletop Multi-Substrate Cutter, NEW!! Rolls Roller 5' x 17' Premium Roller Applicator Vivid Linea-D 42" Dual Hot Roller Laminator, NEW!! 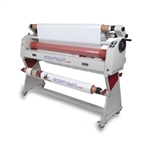 Easymount Sign 55" PSA Laminator w/Heat Assist, NEW! !